It's summertime! And Busman's Harbor, Maine is having its first-annual Founder's Day celebration. There's plenty of food, games, art, music, and sea air for residents and tourists alike. Julia Snowden is busy enough with the family's clambake business, but thanks to her sister volunteering her for the Founder's Day committee, Julia finds herself super busy on this particular weekend. Julia is running late, but makes it in time for the kick-off at Founder's Day - and just in time to discover, along with the rest of the crowd, that a body has been baked inside the 'claminator' on the pier. Her newest hire, Cabe, takes off running without even a glance back and Julia quickly finds herself helping the state police with yet another investigation. Ross's novel combines her personal experience with a Maine community with a fictional world that gives the story a nice balance. She entertains the reader with a seascape (and several sunsets) and a unique, quirky, fun, and friendly cast of characters. Julia has a big heart and a the bad luck of being in the wrong place at the wrong time. She'd love to spend more time with her boyfriend, who's working several jobs to make ends meet, yet questions herself about the longevity of the relationship since she wants to get back to New York and he's never going to leave Maine. I've always loved visiting and vacationing along the Maine coast, yet in all my years, I've never been to a Maine clambake. This novel gave me a feel for what to expect from a clambake and I'm looking forward to attending my first next week. There were a few mouthwatering meals mentioned in the novel and I'm looking forward to making a few of them soon, thanks to the recipes included. It's also blueberry season during the story, and I enjoyed an insider's look at the process of picking native blueberries (and then enjoyed some non-native blueberries with my breakfast). The novel made me very nostalgic for my old beach house, and I think it's a great look at a small Maine community. 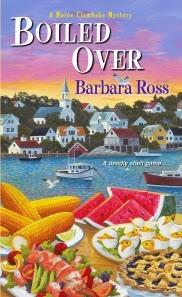 This is the second novel in Barbara Ross's Maine Clambake Mystery Series. The first novel is Clammed Up. She has also published a mystery novel,The Death of An Ambitious Woman, and numerous short stories. Ross is co-editor/co-publisher at Level Best Books, which produces an award-winning anthology of crime and mystery stories by New England authors. I thoroughly enjoyed Boiled Over and read it in 2 sittings. I started it late one night and couldn't stay awake, but finished it the next morning. It's an entertaining, fast-paced page turner. If you’re interested in learning more, visit Barbara’s website, or check out her posts on the Wicked Cozy Authors blog and the Maine Crime Writers blog.